The host presents the latest news, updates and developments on politics, current affairs, business and major happenings across India. 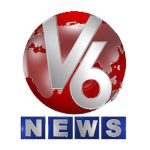 V6 News is a Telugu News channel focused mainly on catering news of Telangana state to its people. The channel features various Entertainment programs along with News. V6 Channel which is mostly Telangana based offers news in Telangana Accent which appeals to the most of the Native populace. Apart from delivering the Political, Crime, Entertainment, Sports, Business and other News. The character who enjoys a huge following of the audience delivers news along with his comments from different areas both rural and urban in pure Telangana accent in the show “Teenmar News”. The show is loved by the audience and has received accolades from many. Other reputable programs on this channel are Studio Discussion, Telangana Herolu, Hamaraa Hyderabad etc. Along with these, the channel features interviews with prominent political personalities discussing various issues of the state and society. Many celebrities also appear in these interviews talking about their upcoming films. The channel is one of the most popular news channels in Telangana and is available everywhere across the world live via YuppTV.